Denver Game Development Companies at COMIC-CON and DENVER INDIE VIDEO GAME EXPO. Be sure to stop by our LIMN INTERACTIVE display in the video game section of the 2014 Denver COMIC-CON. Also arrive early for the VIDEO GAME DEVELOPMENT PANEL because we fill up quick every year. There will be previews of new games in development and more surprises this year with the new platforms and great games arriving. More Q&A this year, console, PC, indie, and mobile. Visit with us at the new Cherry Creek Microsoft Store location on June 3rd, 7pm. Representatives from the Colorado Chapter of the IGDA (International Game Developers Association) will present some video games and we often give stuff away. We will also discuss Denver eSports, Xbox One development in Denver, and upcoming Colorado video game tournaments and events. 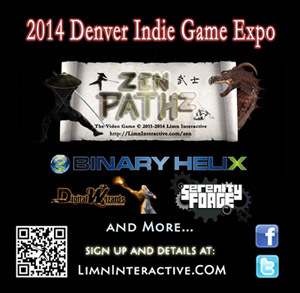 Come chat with the top Denver game companies showing off their latest games at the 2014 DENVER INDIE VIDEO GAME EXPO. This event has limited seating and fills up every year so make sure to sign up early. You can sign up for the 2014 Indie Game Expo HERE. If you are interested in showing a portfolio, demo, games, or anything else you are working on, sponsoring, or getting involved in future events, let us know.